never pay full price for fuel. Fuel Rewards members save at least 3¢/gal on every fill-up at participating Shell stations. Fuel Rewards members always pay less at the pump. Join the program for free, it’s quick and easy to get started. Link your credit and/or debit cards to maximize your savings. Shop with participating retailers and earn Fuel Rewards savings. Save at the pump when you lower your price-per-gallon. Earn at least 5¢/gal for every $50 you spend shopping the brand names you know and love. Join today and get your free Fuel Rewards card. If you picked up a card at a participating Shell station, you can register it here. Or, you can order a card when you sign up – we'll send it to you absolutely free. 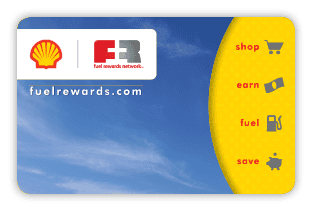 Swipe your Fuel Rewards card at a participating Shell station. The pump will automatically roll back by your available Fuel Rewards savings balance. No rewards in your account? You'll save 3¢/gal just for being a member.